Offshore mooring chain is widely used for oil drilling platforms and other offshore structures to fix the platforms and avoid movement. Due to the working environment is very harsh, the mooring chains should have high strength, good toughness, wear resistance, fatigue resistance, corrosion resistance etc..
Weitong Marine offers a variety of Offshore Mooring Anchor Chains with diameter 34mm-162mm, and stud mooring chain and studless mooring chain. Application: Offshore Structure, Oil Drilling Platform, Single Point Mooring Structure etc. 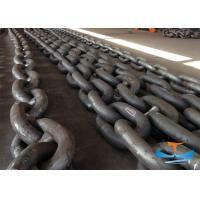 Offshore Mooring Anchor Chain Certificate: ABS, LR, BV, DNV, NK, GL, KR, NK, IRS,RS,CCS etc. We guarantee the quality,not just because we have a complete rigorous management, production and inspection processes to control the quality and avoid detail mistake, but also we attach much importance to customers’ satisfactory of product quality. What’s more, Mill Test Certificate can be provided for general products, and most of our products are approved by CCS, ABS, DNV, BV, NKK, KR, LR, GL, RINA etc. Your request is promised to be reponsed within1-12 hours. Our experienced sales team get technical support from our engineer team to ensure swift offer and good communication. We have rigorous production schedule and professional follow-up process to control the production time. Clients will be informed about the production process in time. Besides, we cooperate with reliable logistic partners to assure the goods to be delivered to you punctually.